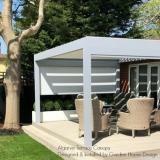 ELLICE® Our simplest and innovative patio cover offers sunprotection and a waterproof roof system, equipped with rotating aluminium tiltable blades on the roof. The aluminium roof blades rotate up to 150 degrees enabling you to decide how much sun protection and/or ventilation you require. When closed, the blades form a waterproof roof in normal showers. A gutter system drains the rainwater away down the leg columns. All of which is operated by remote control. Given its sleek and slender design and availability in 20 gorgeous colours, the Ellice® fits in with any building style: contemporary, traditional or modern. They can be mounted in various ways: stand alone on 4 columns or wall mounted to an existing building. 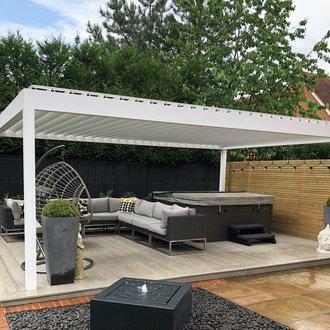 Slightly less sizes available than our other louvered canopies,but still plenty to choose from; smallest 3m x 3.9m going through at approximately 200mm increments to the largest 4.5m x 6m. 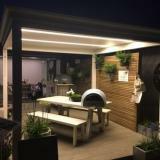 You can design your Ellice® as a private dining area, position over a hot tub, cover an outdoor kitchen, or simply have large sofas underneath as the ultimate outdoor place to relax. The Ellice® design can also have LED lights placed into the design, and our range of automatic Fixscreen blinds can also be used to create further privacy, and protect from the sun, wind and rain.